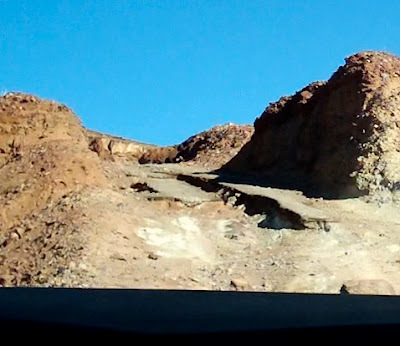 Before heading to Opal Mountain, I drove over to Kramer Arch to test my under-rover cam. I've previously only tested it on flat paved roads in my neighborhood. It's a 600 line B/W low light camera that I mounted magnetically to the chassis. That makes it easy to setup and remove. 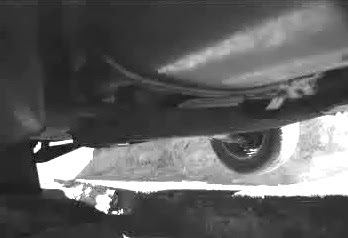 The camera is then wired (around the truck and in the window) to a USB A/D converter and into a laptop for viewing and recording. Here's a photo of the eroded old asphalt section of the road to Kramer Arch. It's not real hard and it won't damage my camera for this test. The goal is to drive up onto the upper asphalt ridges. Then you're fine. Unfortunately, I forgot to use the right settings in my capture software and I learned later that it was capturing video at a craptacular 352x240 frame size. I do this so seldom, I really ought to make a checklist or something. I'm not posting the video here because it had a lot of tech issues. The video signal goes out sporadically. This didn't happen on a flat paved road. hmmm Much to think about and improve for next time. Instead, I'm posting several screen caps of the video. 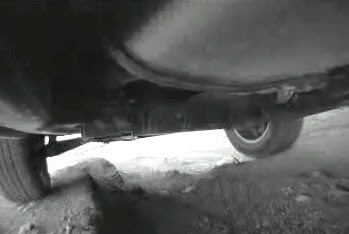 The camera is pointed toward the front of the truck. Its FOV is 120 deg. 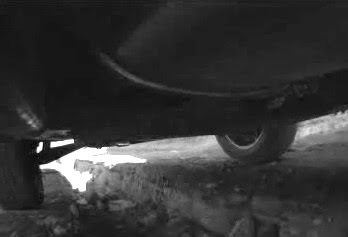 The second shot shows the right front tire having just made it up atop the asphalt. 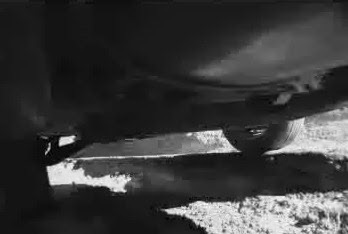 The third shot shows the right front tire off the ground while the right rear was driving up onto the asphalt ridge. 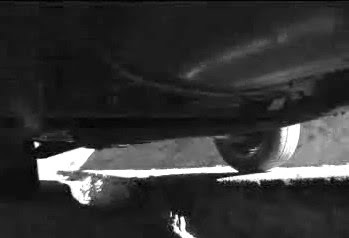 The fourth and fifth shots show the truck driving on the asphalt stradling the gully. So I need to solve the problem with the video outtages. Also, I noticed that the camera wasn't being held very stiffly in azimuth - it easily moved/turned from right to left when I touched it. I may have to modify my mount.